"Bikes and roller skates have a long and incestuous relationship," Addison Wilhite tells me as we're waiting for a break in traffic so we can cross Lakeside Drive and ride back up Windy Hill, the one decent acclivity on his 12-mile commute to work. It's a cool night in a string of hot ones and the wind is whipping up a major forest fire nearby in the Mt. Rose Wilderness. In Reno, headwinds blow in every direction and Addison's daily route to his job as a high-school English teacher never seems to offer the joy of a tailwind. For a time, Addison was the curator of the National Roller-skate Museum in Lincoln, Nebraska where he learned about the bike-skate connection and posed for a Smithsonian Magazine photo shoot. So I ask, "What's the connection between bikes and skates?" But the break in traffic comes and he takes off without answering. Addison and I are tackling the bike-to-work-month-challenge (on bikes, not skates.) We'll each ride more than 400 miles this month, rocking two wheels instead of four through the chilly and sometimes blustery mornings. Addison is chronicling his efforts via blog, sharing the pains and joys with the world. "Something about riding in weather like this is so peaceful," he wrote on his 5th day of commuting, a camera phone snapshot of a frosty dim countryside added for emphasis. It's the idea of foul weather that scares off many would-be bike commuters. But in a world where mud-slinging trucks are advertised as a symbol of ruggedness, we have to ask just how rugged can you be if you only venture outdoors in the comfort of your heated/air-conditioned/poshly-upholstered luxo-wagon? Technology can turn us into sissies, or it can help us actually contend with our environment. Addison keeps warm thanks to the miracle fiber produced by state-of-the-art organo-bio textile machines commonly known as sheep. Australian-wool tights and a bit of good ol' American fortitude keep him warm and happy. In fact, this sheep technology may even work too well. "I used to ride in much colder temperatures on a mountain bike though ice and snow," he says. On a nice evening in August he admits, "I feel like a wimp now." Wimp or no, there are still days when the idea of riding to work gets the best of you and the car beckons like a carnival pitchman. But there's always a foolproof way of ignoring that call. "It's been said before," Addison wrote on day 22, "but as a cyclist, when you have one of those days where you feel tired and dread getting on the bike, the best cure is throwing the leg over your bike anyway, and a few pedal strokes later your brain reminds you with an, Oh, yeah, this is why I love to ride my bike feeling." Addison, like many others, found that preparation for any commute is a matter of habit. "The first couple of days I agonized over it," he says. "The difference in temperature around here is such a big deal." But he got his system down and a feel for what he needed. "After that it was easy, very easy." Nutrition was one thing he had to work into with 40 minutes of exercise twice a day. "I need to be better about getting enough calories during the day. I've been close to the dreaded "òbonk' a couple of times on the way home." Addison doesn't like to carry a rack or put too much extra gear on his svelte Rivendell All Rounder. "They're practical and everything," he says of the new slew of cargo bikes, "but for me it's all about flying across the planet. It's more fun to be light and free." Light, free, and more powerful, perhaps. "I'm wondering how much quicker I would get to work if I could stock up on a supply of EPO," Addison wrote on day 19, musing on the admission that Bjarne Riis had doped for his tour win. Still, an urban cyclist has to make compromises. "I'd been so lazy and such a slacker [in previous months] it was just important for me to follow my own, like, letter-of-the-law-rules," he says after admitting that he had to make a weekend run to work by car to drop off some clothes and supplies mid-month. "I said I'd ride to work every day that I work. So that's what I did, and even though it made more sense to drive one day a week for supplies, It would have violated my pact with myself." There are hassles with this bike commuting, for sure. But you work through them, same as with the car-hassles of traffic, insurance, fuel, the DMV. But Addison and I just keep "throwing a leg over" and the ride continues. Fortitude. From time to time I ask about the roller-skate connection but the answer is elusive. Addison plans on riding 15-17 days a month in the fall school year based on his habit forming month of May, balancing the bike ethic with the realities of being a teacher. Read more about his commute, biking, music, TV, movies, and the occasional tasty bike-roller skate intertwinement at reno-rambler.blogspot.com. 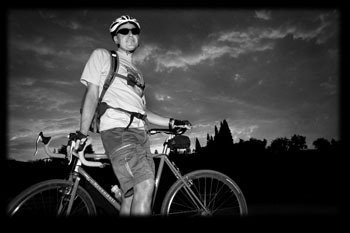 Mike is a writer and aspiring urban bike geek from downtown Reno, Nevada. He just picked up a splendidly disreputable urban riser-bar road bike with some SWEET dia-comp brake levers from The Reno Bike Project and switched all (three) of his spoke cards over. Read more about the project @ renobikeproject.com.